Join the discussion on our forums! 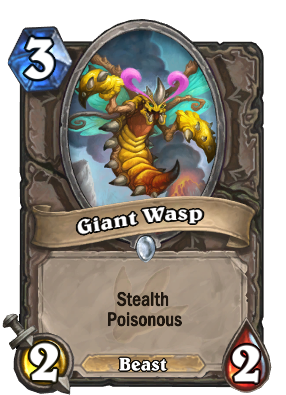 Come discuss Giant Wasp over in our dedicated Giant Wasp discussion topic. It's because it's Shadowflame doing the damage, not the wasp itself. Nice Muhammed Ali reference flavor. Reminds me of a Mutalisk. why is this wasp wearing spiky oven mitts? if you ask me this is a great card for classes lacking removals like paladin. Even more fo rpaladin as it has stealth. So... Patient Assassin was an epic. And a class one. In case of Poisonous, adding more stats is pointless so the mana cost here is a pure downside. I would say this card is a lot worse than Patient Aassassin, the only upside is surviving 1dmg aoe. "more stats is pointless" umm no... Attack sure, its doesn't matter, but health? it absolutely does, the more health it has the more likely it is to survive aeo, that "only upside" is pretty significant, it means it requires a bigger commitment to get it off the board. I would say this is much better than patient assassin, even if we are talking about a single health point it does make a difference. I don't see this getting played much, but it's nice to have as a tech card. Does anyone else find it weird that they reprinted Patient Assassin, gave it a buff, stuck beast tag on it and made it uncommon? I don't know, but it seems pretty common to me. This is a lot worse than Patient Assassin. One extra mana for nearly the exact same effect. I mean... 1 or 2 power doesn't matter, both cards still oneshot everything they hit. Face damage and 2 health is SOOOOOO much better than 1 health. Malestorm, Ghoul, Whirlwind, Wild Pyro. So many things deal 1, but not 2.